Explanation: What's creating light-toned deposits on Mars? Quite possibly -- water! Images of the same parts of mid-latitude Mars taken over the years but released only last week have shown unexpected new light-toned deposits where there were none before. One clear case is shown above, where the same crater on Mars is shown as photographed in 1999 August and again in 2005 September. The unusual deposit is visible only on the more recent photograph. 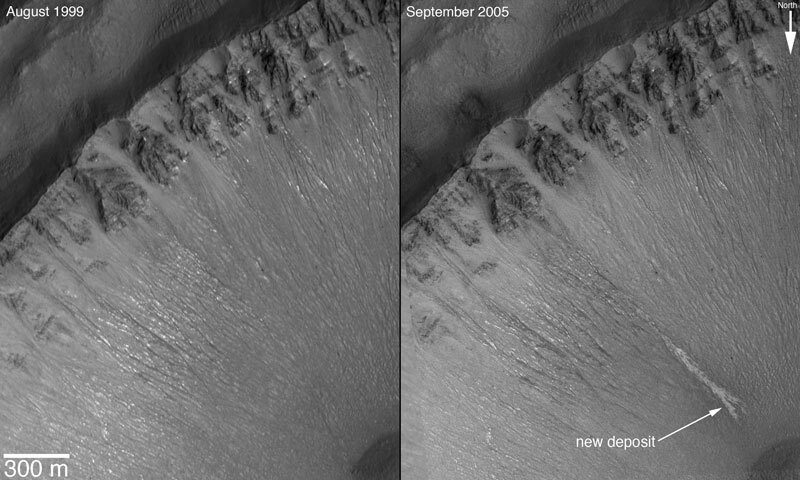 Apparent tributaries near the bottom bolster the leading hypothesis that water gushed out of the crater wall, flowed down the crater, and soon evaporated into the thin Martian atmosphere. Although frozen water-ice has been known near the Martian poles for years, free flowing surface water like this was not expected to be seen in the mid-latitudes of Mars. If confirmed, such water springs might make more of Mars hospitable to life and human visitation than previously believed.